Deglazing is removing the old putty and the glass pane from the sash. Deglazing might be necessary to replace the pane or to take apart the sash for further repairs. Often deglazing must be carefully done to preserve the glass for reuse. At minute 14:20 in the video you can see where I've removed paint from the margin of the face of the sash, so the sash less likely to generate lead-containing dust and the associated health risk. Video: The sash is placed in a box that is filled with steam. The steam softens the old putty and paint so it is easy to remove by scraping. An infra-red heat lamp is used to soften interior paint so it can be scraped off down to bare wood. 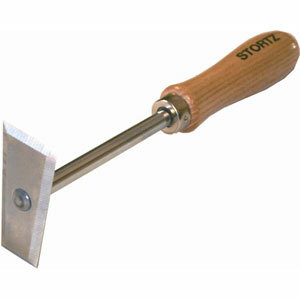 Stortz tools are well-known for their quality. At $12 each these scrapers do not seem over-priced. Their only downside is the wide acute bevel. As I use and re-sharpen this scraper I made a narrower and more obtuse bevel that controls the cut and make an edge that lasts longer. They are Made in America, and I'm now recommend the Stortz scraper over Marshalltown's scrapers, which are made in China. --First consider if the pane must actually be removed from the sash--a good strategy if the glass is particularly thin and fragile. Perhaps spot putty maintenance will be adequate. Perhaps only the front putty needs to be removed because the bedding putty is in good condition and the glass is still tightly sealed. --If using a heat method to soften the old putty: Before you start, gently warm up the whole pane slowly and evenly. The National Parks Service has a method of reducing heat cracking during deglazing by gently warming a sash before using any heat method of deglazing: Work in a warm shop, 80degrees plus, slowly warm the sash in a box that brings the temp up to 110-120degrees The heat in the box is dry air, not steam. Then deglaze using a heat method, usually hot air gun or infrared. This reduces the localized temperature difference, which is what cracks the glass. This also tends to dry out the sash so the wood is narrowed and the pane is looser, but don't heat the sash too long or you'll get drying checks in the wood. --Chemical Stripper: I did use chemical stripper once. The pane had important names and dates going back nearly 200 years scratched into it with a diamond ring. Breaking the pane was absolutely out of the question. Method: test 3 different chemical strippers and pick the one that works best; brush it on the putty keeping it off the wood and glass; let it work for half an hour; scrape off 1/32" to 1/16" of the softened putty with a pull-type scraper; repeat. The bed putty was still good so we left the pane in the sash. It took four hours, during which time I also deglazed two other sash using more ordinary methods. I billed three extra hours to cover the slow-down on this one sash, one hour during deglazing, and two hours for special handling (protected the sash with ply on both sides and foam around the edges during all handling and moving). This was considered "conservation" level work, a step beyond ordinary preservation or repairs and maintenance. --Turn the temp on your hot air gun down as much as possible and still get some softening effect on the putty. 250F. to 350F. should be hot enough. --Also try an infrared heat lamp. Clean both sides of the pane before starting. The infrared rays will pass through clean glass and not heat it up. Dirt or grunge on the glass can catch the infrared rays and heat up the glass. --Remove the little line of putty from between the edge of the pane and the neck of the glazing rabbet. A crack tool makes this go slick and quick. This helps loosen the pane from the glazing rabbet. --Always lift the long edge of the pane up first. This puts less stress on the pane because it is across the shorter dimension of the pane. --Keep a written record of how many panes you don't break and do break. At the end of every day or week add then up and compare with your past record. Also, occasionally write down how you feel when one comes out particularly well, and how you feel every time one breaks. This will put your subconscious mind on notice to help you improve. Adapting the steam hose of the Wagner 705 Steamer so it fits the standard 1 1/4" steam heads. The steam warms up and softens the old hard putty so it is easier to scrape away.